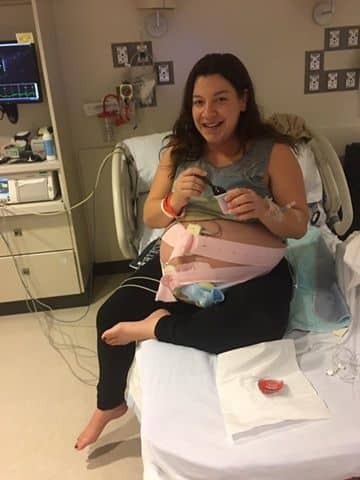 Twin Hypnobabies Induced Birth – Mom Feels like a Rock Star! When I found out I was pregnant 9 months ago, I was so excited to plan a totally natural water birth. But at our 20 week ultrasound, that plan was quickly tossed out. I was simultaneously shocked and not surprised at all. Maybe a little voice spoke to me or maybe it was mother’s intuition, but I knew there were two babies. I even told my mom to expect twins before the ultrasound. And I also wasn’t surprised when we found out both were boys. I knew they would be. But even though in my heart I knew it, it’s a totally surreal experience to have those hunches confirmed. It did mean a change of birth plans though. The midwifery and OB/GYN I go to only do twin births in the hospital, and the actual birth takes place in an operating room. Not exactly the relaxed birth center water birth I hoped for, but I was happy with the practice and didn’t want to change providers, so we agreed to a hospital birth in the OR. This was my second birth using Hypnobabies, and in my first I had used the Hypnobabies tracks and techniques to stay pretty comfortable for most of my birthing time (Hypnobabies word for labor), which was very long as I had prodromal birthing time stretching out over a week. 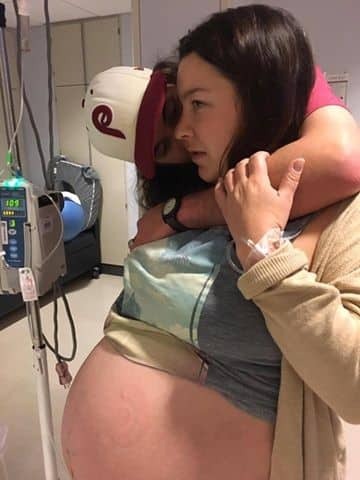 I planned on a birth center water birth for that one too, but I did end up consenting to both an epidural and Pitocin at the hospital in the end because I was exhausted. 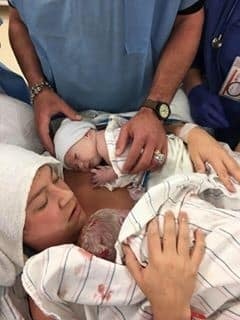 My recovery from that birth was easy and quick, but since that birth didn’t go as planned, I wanted to do everything I could to try to make my twin birth as close to natural as possible. I had an extensive list of birth preferences and newborn care preferences because I wanted to be as prepared as possible. With a few fairly minor changes, my doctor and midwives were on board. If I was able to accomplish these four things I would feel like it was an awesome birth. And guess what… I did them all! The toughest decision I had to make during the pregnancy was whether or not to induce. Some studies show an increased risk of stillbirth after 38 weeks with twins. The risk is not huge, but my doctor felt it was greater than risks of induction. My midwives were kind of on the fence, but mostly wouldn’t go against the doctor’s recommendation. I did eventually agree to an induction, but pushed it to the end of the 38 weeks and scheduled it for October, Friday the 13th. When that day actually came I was pretty surprised I was still pregnant! In the days leading up to it I had tried tons of natural and at home methods of inducing, even two rounds of castor oil. Plus I had been having early birthing signs for weeks! But my boys were way to cozy to come out. So at 9:52 am on the 13th I was at the hospital with an IV of Pitocin. When I arrived I was at 2 cm and 70-80% effaced. We didn’t do a Foley bulb or any addition medication. Just the Pitocin with fluids. Within a few hours I was on the maximum dose of Pitocin. During this time I alternated between Hypnobabies tracks and napping. Over the course of that day and night I had a few times where I felt like I was heading into my active birthing time, but each time it fizzled out. The good news was I was very comfortable this whole time. In fact the most uncomfortable part was my monitors on my belly kept falling off or stopped picking up two babies and would both pick up one. So every 20-30 minutes or whenever I moved the nurses would have to come adjust them, which took 10-20 minutes each time. But all of them were amazed at how calm and relaxed I was even with all the poking and prodding plus Pitocin. At one point I had a doctor doing an ultrasound plus 4 nurses trying to get the monitors on me properly. A lot of the time I would just tell them I was going to listen to my tracks and would be off (Hypnobabies technique for being deeply in hypnosis), but do what they needed to do. So I didn’t even really notice them. I mostly listened to Deepening (Hypnobabies track for deepening hypnosis), Come Out Baby (Hypnobabies hypnosis track for encouraging baby to be born) and Strengthen My Birthing Time (Hypnobabies track to strengthen birthing waves) during this time. The other difficult part of this for me was not being able to eat. The hospital policy was only clear liquids, and while I may have bent those rules a little, I didn’t want to overdo it. So I was really hungry half the time. Once we got to 6 am Saturday morning, I asked if we could take a break from the Pitocin so I could eat, take a shower and rest for an hour or so. The midwife was fine with that. So I ordered a huge breakfast, had a shower, sent my mom and husband home to shower and rest for a little, and prepared myself to start again. My midwives were all great about basically leaving me alone and keeping cervical checks to a minimum. I think besides when I first got there I was only checked once more in that 24 hours. They were really following my lead on how I was feeling. So I don’t remember exactly at what time they checked but at some point I was at 4 cm. We agreed that once I got to 5-6 cm we might break my water. It was just kind of a waiting game at that point. But I never got past 4 cm, and around 8-9 pm on Saturday my midwife suggested we just go ahead and break the water. I agreed. I was ready to either stop for a while for another break, or move forward with a new plan. So I went with the new plan. Since she was breaking my water anyway, she also attached a monitor to Baby A’s scalp. I thought this would be so uncomfortable, but compared to the belly monitors falling off and having to be readjusted all the time, it was so much better! It helped me have more freedom of movement. So I was able to really get on the birth ball and walk around to help encourage the baby to get into position. He had so far been floating around in the right area, but not fully engaging. I tried all I could to get him into position before that, even having my chiropractor come to the hospital to adjust me! Once I did all we could think of to get baby into position, I decided to try to rest. I’m not sure how long I was laying down, but around midnight or 1 am, I started to feel some activity. I didn’t want to get my hopes up because I had been having pressure waves (Hypnobabies word for contractions) off and on for days, but this felt promising! My mom and doula were with me, but my husband was at home. I had sent him back to get some rest because I didn’t know if anything was going to happen that night. By 2 am I was pretty sure it was the real thing, and I told my mom to call him back. It’s so crazy because I’ve read a lot of birth stories, and I have researched a lot about birth, but your rational mind at some point goes into the background. I started doubting myself and was worried that I was wrong and this wasn’t the real thing. I ended up crying hard for about 15 minutes because I was so emotional, but just letting myself cry between the pressure waves felt good and let me release my fears. At this point I thought I was in transformation (Hypnobabies word for transition) because I wasn’t getting breaks between the waves. I had stopped listening to my tracks, but was using the Peace cue a lot at the peak of every wave. Oddly, I also would sing the first line of the Beatles “Let it Be” in my head between using the Peace cue. I wouldn’t say I felt comfortable during this period of time, but I was calm and felt pretty confident. I felt a lot of pressure and intensity in my back, just like I had with my daughter. I don’t know at what time exactly but at some point my midwife said we should move to the OR, but my husband still wasn’t there yet! Eventually he made it though and we got to the OR. Having to be on my back on an operating table was the worst part, and by the time we moved over there I had regressed by a cm. So I had to wait a little to push, and then when I did start my midwife helped me by holding my cervix out of the way. At the beginning I could tell I wasn’t really ready to push, but it gave me something to focus on, which helped. I asked my husband to play the Pushing Baby Out track (Hypnobabies special track just for pushing), but once it started I didn’t want to listen to it anymore, and instead had him play one of my favorite playlists. So I pushed my babies out to the sounds of the Beatles, James Taylor, Van Morrison and others. After I was pushing for about 30 minutes I actually started feeling the urge to push and could feel that I was making progress. I don’t know exactly how much longer I had to push, but it was less than 30 minutes. At 4:29 am on October 15, Sebastian Charles (Bash) was born! He was covered in vernix, barely made a peep, but just looked at me intensely and started rooting to nurse almost immediately! While I was focused on him, the nurse and midwife gently pressed on my belly and guided the next baby into position. I gently pushed at my own pace for a little bit until I felt like I wanted to push him out. With 2-3 big pushes Maximus James (Max) was born at 4:46 am. He had tons of vernix and wanted to nurse right away too! Bash was 6lbs15oz and 19in. Max was 7lbs2oz and 19in. I had only a small 1 cm tear that didn’t even need stitches. The most challenging part was birthing the placenta and then the midwife and nurse pressing on my belly after the birth. Risk of hemorrhage is higher with twins so they were pretty aggressive with it. But I used my Peace cue and I turned off some of the time and managed to birth the biggest placenta ever and get through it all. It wasn’t the birth I planned on originally, but for having a twin birth induced in a hospital I think it went as perfectly as it possibly could have and I am insanely proud of myself and my little boys. Postpartum has also been an amazing time. I had tons of emotions for the first few days as expected, but this has been a much smoother transition than it was with my daughter, even though I have two newborns at home! I didn’t use my Hypnobabies tracks at the end of my birthing time as much as I had anticipated, but the Peace cue was my bff! I also really relied on the tracks during the induction to stay comfortable, calm and even get some naps in. I feel like a Rock Star, and think I accomplished the most amazing thing I might ever do!